With just a bit more thought, one would realize that the EGO is not the problem, but the ALTERED EGO is. 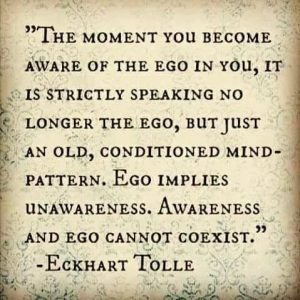 It’s the EGO that has become aware of itself; aware that it has been altered by old conditioned mind patterns, or, as I like to refer to them as imprints, programs and beliefs. It’s problem solving 101, something that the author of the meme and quote don’t have. An analogy would be that a person realizes that their shoe lace has broken and is causing them to trip and stumble. Now is the person that is wearing the shoe with the broken lace the problem, or have they just recognized that there is a problem. Food for thought… or not. This entry was posted in Self-Empowerment, Society - Culture, Soul (Will) - Intuition-feelings-emotions, Spirit - (Mind) Thoughts - ideas and tagged altered ego, beliefs, critical thinking, ego, imprints, problem solving, programs by johnrieger. Bookmark the permalink.